Aloe vera constipation cure is one of those reputed healthful benefits that the Aloe vera plant offers. Many folk have discovered that Aloe vera can help with regularity issues although the research world continues to investigate its properties. In fact when you think of the thick, serrated leaves of Aloe vera plants you probably associate the Aloe vera leaves with that translucent gel that can be scooped out of the center and applied to cuts as a cooling soothing remedy, or eaten fresh for digestive benefits. But the gel itself is surrounded by a more fibrous constituent that is rich in a substance called Aloin (well, it would be wouldn't it? Aloe - Aloin?) -- a type of latex (a natural rubber like material). In fact, whilst the gel has noted soothing properties Aloin can act as an irritant. It it is this property that is asssumed to stimulate the bowels into movement, therefore making Aloe vera constipation remedy have its reported beneficial effect. 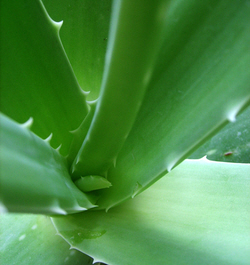 Indeed this pulp-like (as opposed to the gel) element of the Aloe vera plant has been used for many years in ancient forms of medicine. For example the pulp is reportedly used widely in Siddha medicines in the treatment not only of constipation, but also enlargement of the spleen, zymotic disease, chengamaari (a type of venereal infection) and various other conditions. Also see our additional insomnia cure and sleep problems articles, which could be useful to sufferers of typical menopause symptoms. The content of this website is provided for general informational purposes only, information appearing on this website should in no way be construed as diagnostic and is NOT meant to replace the advice of a qualified medical practitioner. Whilst information is researched and drawn from reputable sources, no guarantee can be made by www.GoNandO.com for its provenance or accuracy. Should you have any health or medical concerns whatsoever you are advised always to consult your family doctor at your soonest opportunity. The authors/owners of www.GoNandO.com cannot be held responsible in any way whatsoever for any use made of the information provided on this website. Please note that articles and reviews may relate in some cases to products or services for which the publishers of www.GoNandO may receive a remuneration by way of an affiliate fee, or other reward or payment, should a purchase be made after using a link from the site. This is Important: Using our links will NOT affect your statutory rights NOR will it inflate or otherwise adversely affect the price you pay -- but we would like readers to be aware that this process is what allows us to fund, maintain and develop the website for the benefit of all. Currently, such income fall below requirements and we are funding the site out of own resources, if you have found the information in any way useful we are always very appreciative of a small donation made via PayPal to the creator and p8ublisher at the address algsmith@algsmith.com We thank you in advance for using our links to examine any recommended products more closely, and particularly thank you should you decide to make a purchase from which we may derive a small benefit, or make a direct donation as outlined above.